One can not be a "halfway" Christian, leaving Jesus within the walls of the church and avoiding witnessing it "in the family, in the education of the children, in the school, in the neighborhood". From this "hypocrisy of the righteous" Pope Francis warned in the Mass celebrated Friday morning, October 5, in Santa Marta. The Pontiff's meditation was inspired by the Gospel passage of Luke (10.13-16) proposed by the liturgy, in which "Jesus reproached three cities - Bethsaida, Corazin, Capernaum - because they did not listen to his word. They only heard, but that word did not enter their hearts, because they did not believe in the signs, in the miracles they did. " The Lord's warning is explicit: "But if in these pagan cities like Tire and Sidon, I had done these miracles, sure they would have believed. But you do not. " Francis pointed out that Jesus "seems angry". And he recalled that immediately afterwards, in the same gospel, he "speaks of conversion, with the preaching of the prophet Jonah:" And you, do not you convert? "». It is, he underlined, "a strong rebuke of Jesus to these cities, to these peoples who, having there, seeing his wonders, are always in the logic of" Yes, but ... Never know ", and not give the step to recognize him as Messiah ». Behind "this reproach - the Pope noted - there is a cry", because Jesus "is grieved to be rejected, not to be received". The Lord "loves these people, but feels sorrowful". So "the cry of Jesus is behind the reproach," Francis reiterated, recalling when the Lord "from the mountain saw Jerusalem far away, and wept." In effect "Jesus wanted to reach all hearts, with a message that was not a dictatorial message, but it was a message of love. And Jesus cried, because these people had not been able to love ». At this point the Pontiff, updating his reflection, proposed to change "a little 'the characters of this event: instead of Corazìn, Betsàida, Capernaum - these cities - we put ourselves, I put it: I have received so much from the Lord. Each of us". Hence the invitation to the examination of conscience: "Everyone thinks of their own life. That I received so much from the Lord. I was born in a Christian society, I met Jesus Christ, I knew salvation, I was educated, educated, to the faith. And how easily I forget, and I let Jesus pass ". An attitude that contrasts with that of "other people who immediately hears the announcement of Jesus, is converted and follows him". Instead, he acknowledged the Pope, "we are" used to it "». And "this habit hurts us, because we reduce the Gospel to a social, sociological fact, and not to a personal relationship with Jesus". 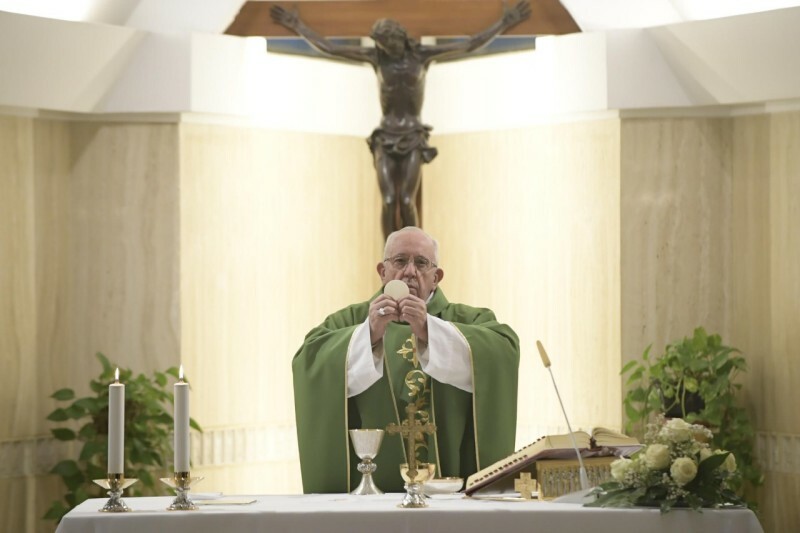 In reality, Francis continued, "Jesus speaks to me, speaks to you, speaks to each one of us. The call of Jesus is for each of us ». And then one wonders: "How come those pagans who, as soon as they hear the sermon of Jesus, go with him, and I who was born, I was born here in a Christian society, and for me Christianity is like a ' social habit, a garment that I wear and then I leave it? ". This is how "Jesus cries on each of us when we live Christianity formally, at least not really". In this way, he urged the Pope, "we are a bit hypocritical". It is "the hypocrisy of the righteous". Indeed, there is "the hypocrisy of sinners, but the hypocrisy of the righteous is the fear of the love of Jesus, the fear of letting oneself be loved". In essence, the Pontiff observed, "when we do this, we try to manage the relationship with Jesus". It is as if we told him: "Yes, I go to Mass but you stop in the church that I then go home". Therefore, he remarked, "Jesus does not return with us home: in the family, in the education of the children, in the school, in the neighborhood ... No, Jesus stays there. Either it remains in the crucifix or the image, but here ». In conclusion, the Pope has renewed to the faithful the proposal of "a day of examination of conscience", recommending to them as spiritual "refrain" the words spoken by the Lord to the cities that did not follow his teachings: "" Woe to you, woe to you "Because I gave you so much, I gave myself, I chose you to be a Christian, to be a Christian, and you prefer a half and half life, a superficial life: a little 'yes of Christianity and holy water but nothing more ». In fact, he explained, "when we live this Christian hypocrisy, what we do is to drive Jesus away from our hearts. Let's pretend we have it with us, but we kicked it out. We are Christians, proud of being Christians, but we live as pagans ". "But Lord, you gave me so much. My heart is so hard that it does not let you in. Lord I have sinned of ingratitude, I am ungrateful, I am ungrateful "». This, he said, "is today's prayer. And let us open the heart, and ask the Holy Spirit to open the doors of the heart, so that Jesus may enter, so that we not only hear Jesus, but listen and receive his message of salvation and give thanks for so many good things he has done for each of us".